Akeem is the Programs Director at The Hidden Genius Project, board chair of The Lorenzo Alexander ACES foundation, and founder of (@Corporately). Akeem’s passion is embedded at the intersections of technology & business, law & policy, and empowering youth with confidence and a skill set to build technical solutions to solve problems specific to their own communities. As a result of his own personal experiences growing up and navigating through underrepresented communities, Akeem’s is known to be unrelenting and unapologetic with respect to creating access and opportunities for historically underserved demographics. 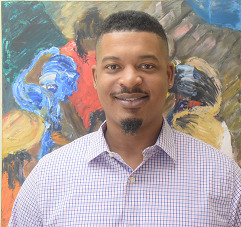 Akeem’s previous professional experience is in law where he served as a Senior Corporate Paralegal overseeing new business venture’s intellectual property, contracts, and compliance matters. Akeem was educated at the University of California, Riverside where he studied public policy and religion.